“What does it mean for Christians to do social justice advocacy as if God is real and Jesus is risen?” is a significant question. Anyone have example regarding how such social justice advocacy relates to (interacts with or even been played out in) their research, field and/or higher education in general? Once again, thank-you to J. Nathan Matias (@natematias), Research Assistant, MIT Media Lab Center for Civic Media for his Urbana12 series. This post in original form (12/29/2012) can be found here. ~ Thomas B. Grosh IV, Associate Director of ESN. This weekend, I’m at Urbana, a gathering of Christian students interested in the work of the church worldwide. Over the last few days, I have been blogging seminars, in which a speaker gives a talk to around 50-60 participants. What does it mean for Christians to do social justice advocacy as if God is real and Jesus is risen? 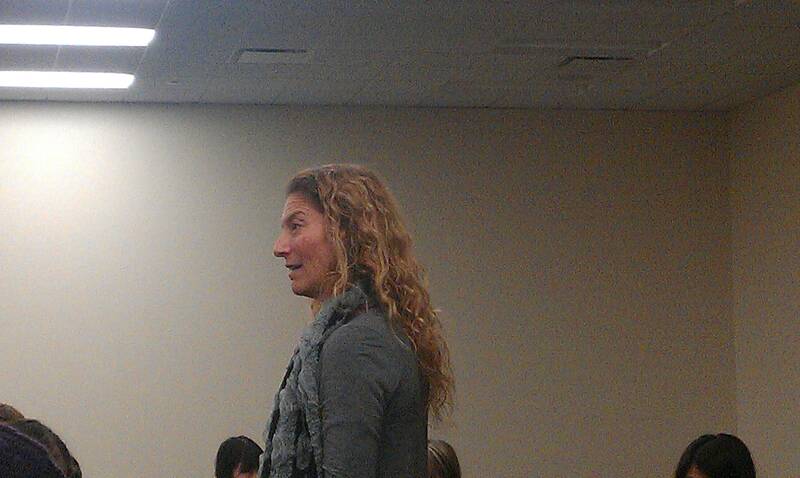 Alexia Salvatierra is a Lutheran pastor and director of justice ministries for the Southern California synod. She also works for World Vision and the Christian Community Development Association. Alexia tells us that in the last ten years, evangelicals have come to realise that the gospel also includes calls to justice. Micah 6:8 is on everyone’s lips, “love mercy, do justice, and walk humbly with our God.” The church often gets confused about what it means to do justice. Christians often don’t do advocacy, often because typical advocacy tactics can feel wrong to Christians, she says. Why advocate for justice? Christians should be compelled by the love of God and the compassion of Christ, feeling other people’s hopes and dreams. Like Jesus, we need to look at people to experience empathy. Jesus also cared for the crowds. We need to look at problems in more systemic ways. And we need to love as intelligently as possible, organising people to create change. Alexia tells us that Christian advocacy involves asking governments “to do what God has called government to do.” She directs us to the call for justice in Psalm 72 and the story of Moses in the book of Exodus. Christian advocacy needs to combine “serpent power” and “dove power,” both general political tactics and Christianity-specific tactics for change. “Serpent power” includes typical political levers like law, elections, negotiation, constituency representation, Op Eds, and direct action. When Christians get involved in this kind of advocacy and come to believe that this is the only power we have, we get spiritual indigestion. To illustrate this point, Alexia tells us a story about Desmond Tutu. She tells the story about police intimidation at the cathedral. How did Desmond respond? He started laughing until everyone in the cathedral, including the police, was laughing. Appealing to them not to shoot, Tutu moves on to offer a sermon against apartheid. Alexia calls this a beautiful example of “dove power,” in which Tutu made enemies into friends via faith and love. Pastoral support is another form of “dove power.” Work as a politician is scary, especially if they’re trying to make a principled decision in the face of influence and money. “We should be the chaplains of the battlefield of politics . . . we need to help them act as if Jesus is real and God is powerful.” If you visit a legislator to encourage them to do right, you will be the only person they meet who cares about them. “There is no greater gift than to help someone be the person that God has called them to be,” she says. Christians can bring prophetic vision into advocacy, helping people remember and achieve their dreams. Alexia tells us a story about her involvement in the Central American peace process. In cases where people are directly or indirectly part of each others’ family members, there can be tremendous hatred. She represented the Lutheran church during a peace process led by Oscar Arias, a gathering of business leaders, academics, and the head of the mothers of the disappeared. It was a tense room. Oscar started by handing everyone notecards and asking everyone to write down their dreams for 20 years. Everyone had written similar things. He asked people if their vision for the future was more important than the pain of the past. The Esquipulas Peace Agreement was signed one week later. Two years ago in South LA, Alexia’s group held a similar facilitation session about immigration reform between the Minutemen, African American organisers, and Latino groups. There, the dream cards didn’t work. People simply didn’t believe that dreams could become true. Alexia decided to change her approach. “What is God’s dream for your community?” she asked. The group laughed sarcastically at first, but it was a moment of great breakthrough. “What’s your dream for your neighbourhood? What would you really like to see made real?” she asks us. Prophets also fight lies, especially the ones that people believe but never speak. Alexia talks about her mentor, Reverend James Lawson, who learned from Gandhi and planned strategy during the American civil rights movement. When Lawson was training civil rights activists, he asked them to identify the lie that motivated people’s racist actions. Back then, the lie was that some people are worth more than others. They then identified a gospel truth that fought that issue. Next, they asked what issue would highlight that lie and allow them to fight it. Even though lynching and jobs were more immediately important at the time, the lie-busting issue issue was segregation. When and where did you first realize that there was a connection between faith and justice? What breaks God’s heart that breaks your heart? What makes your heart sing and brings you joy? Where is the connection between your own deep gladness and the world’s deep hunger? Are you carrying on a legacy? Alexia concludes by skipping quickly through slides on facilitation techniques, principles, and examples of “biblical advocacy.” Download Alexia’s powerpoint here. She also directs us to consider joining an upcoming evangelical mobilisation around immigration reform this spring. I wold recommend Bonhoeffer’s “Ethics.” While some may consider his an “extreme” situation, I would argue that he takes to task the church – instead of the non-church – for its lack of advocacy for justice. His incarnational ethics are exemplary. It is interesting that I should see this post today. Here is a short video from the ministry called Stand to Reason, which expresses my concerns about the term “social justice”.